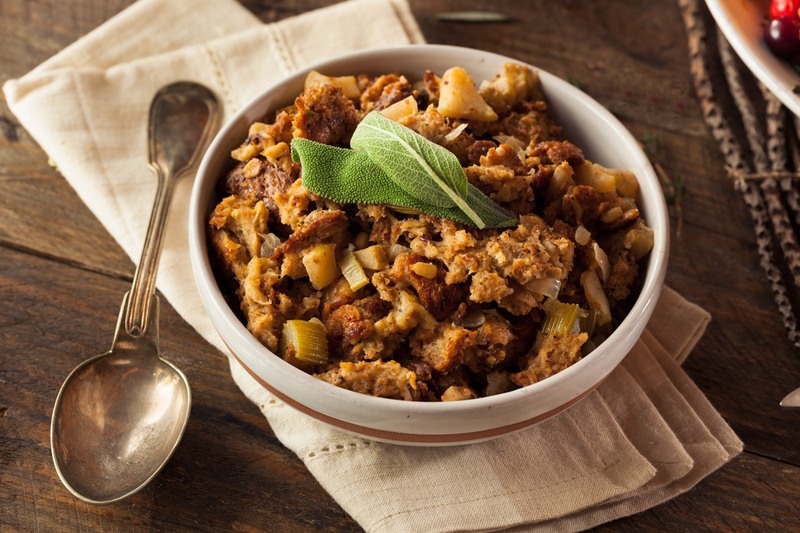 Years and years ago, famed vegan Chef Bryanna Clark Grogan shared her traditional vegan stuffing recipe with us. It was a sample from her time-tested cookbook The (Almost) No-Fat Holiday Cookbook, which is still sold to this day. The recipe below has been adapted just a touch, but it still follows her basic formula. 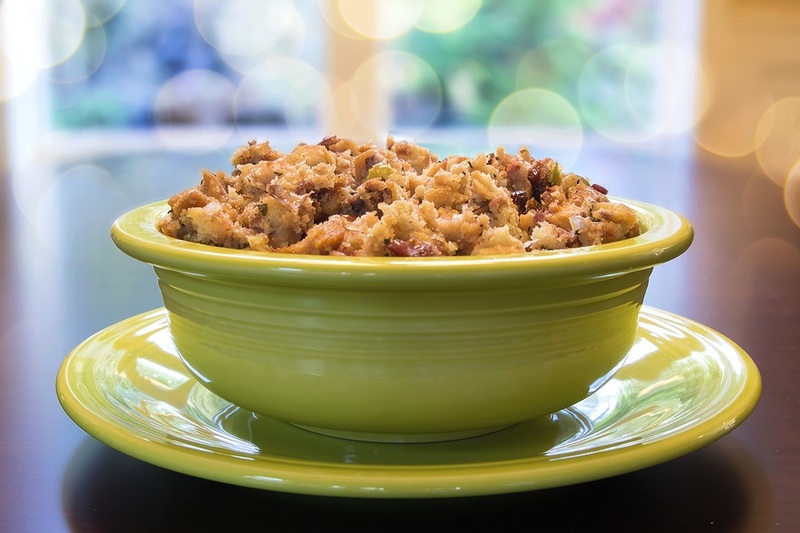 We’ve also updated her holiday-worthy recipe and this post with some helpful notes. 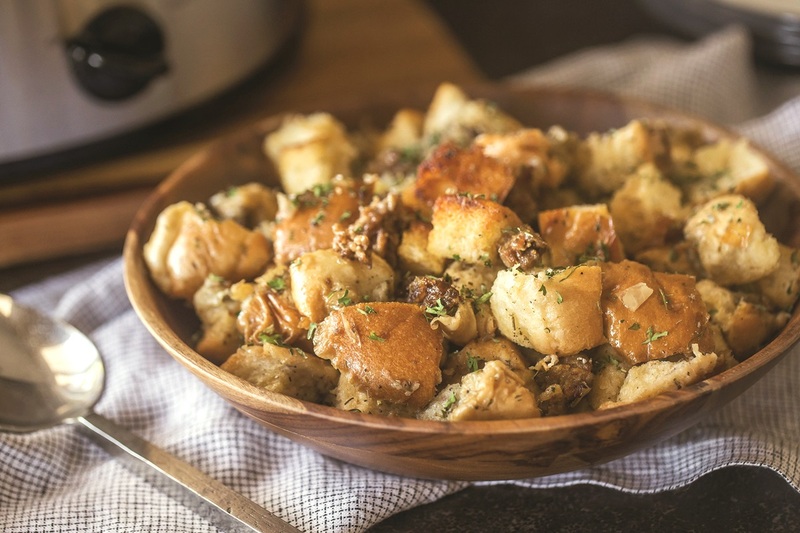 Bread – This is a great recipe for using up stale bread, but it’s okay to use fresh bread, too. If using gluten-free bread, know that it tends to get a little soggier when moisture is added, so you might need to add a little more bread. And remember that lots of bread types and brands do contain dairy. Consult my dairy ingredient list to ensure you pick a safe option. Or go with homemade! Herbs – If you prefer to use fresh herbs, 1/2 teaspoon dried herbs equals about 1 1/2 teaspoon fresh chopped herbs. And you can always add more to taste. Bryanna keeps it simple with the seasoning, but you might like to use a heavier hand. Salt & Pepper – Bryanna didn’t include salt and pepper in her recipe, but we think they are almost essential. The amount of salt and pepper you use could range from 1/4 teaspoon to 1 teaspoon. It will depend quite a bit on the saltiness of your broth and bread. Don’t hesitate to start with less, taste after stirring, and add more if needed. 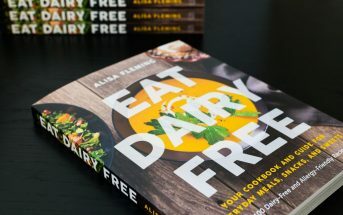 By ingredients, this recipe is dairy-free / non-dairy, egg-free, optionally gluten-free, nut-free, peanut-free, soy-free, vegan, plant-based, vegetarian, and optionally top food allergy-friendly. 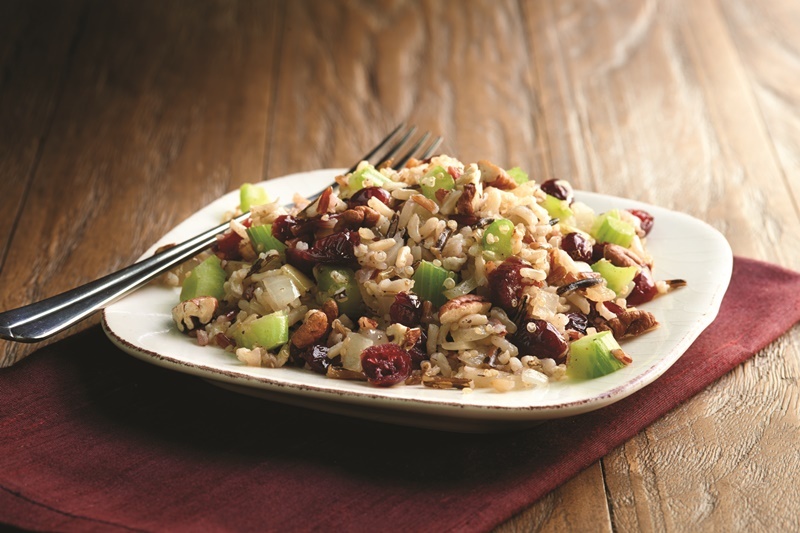 This simple dish is a must for Thanksgiving and other holiday gatherings. Preheat your oven to 350ºF and grease a large baking dish with sesame oil. Heat the olive oil or buttery spread in a large skillet over medium-low heat. Add the onion and celery and saute until softened, about 5 minutes. Remove the skillet from the heat and add the bread cubes, broth, herbs, salt, and pepper. Stir until the bread is fully moistened and the ingredients are evenly distributed. 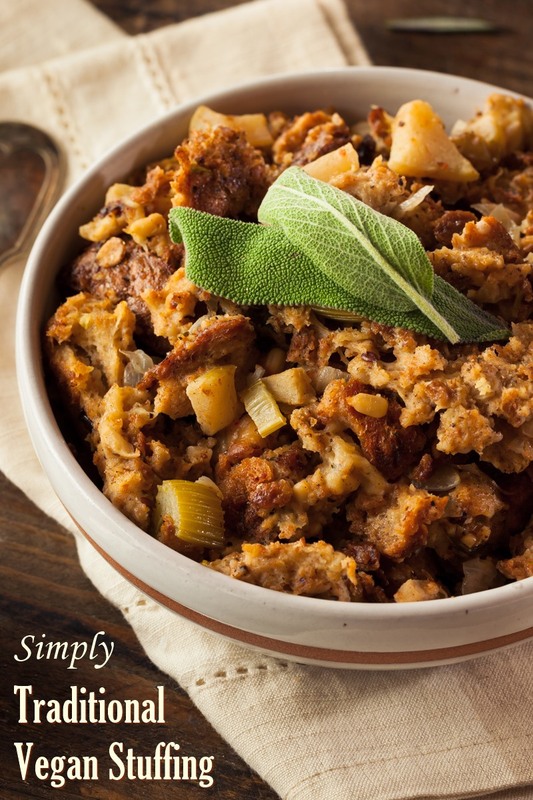 Pack the stuffing into your prepared baking dish. Brush the top of the stuffing with sesame oil. Cover the dish with foil and bake for 1 hour. 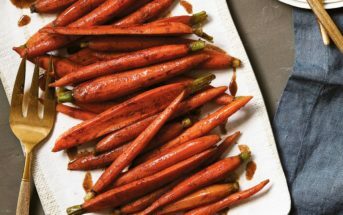 *Bryanna skips the oil and uses a little broth to ensure the vegetables don't stick while cooking. 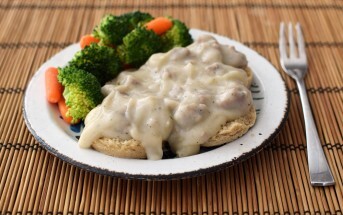 But we prefer the richness and cooking ease from just a touch of olive oil or buttery spread. 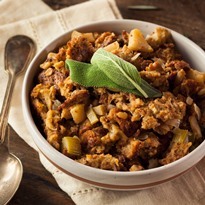 If you want your vegan stuffing to be even a little richer, you can increase the olive oil or buttery spread. What about the bread how do u get bread without dairy or eggs in it or processed in the same place? I use Rudi’s or Silver Hills Bakery.